When something goes wrong it is human to look for someone to blame. In weight issues as well, especially because weight in our view is connected to beauty, rather than health. I mean aesthetics come first, health comes second. Nowadays, after so much mentioning even our children finally started looking obese, even to our loving eyes, and who is to be blamed? 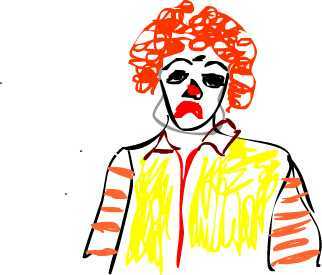 Some groups claim it is all Ronald McDonald’s fault because we all trusted him and wanted to eat more for his sake. So, McDonald’s Corporation first of all, it is being mentioned most of the time, and there are movies made about it, then Burger King, I guess they are also kind of frequently mentioned. Then Coca Cola, corn syrups, sugars, you name it. And given a chance to become healthier, they still are not. Ok, imagine we can ban McDonald’s and the rest of the gang, since they are not going to correct anyways. Let’s imagine it’s a done deal. Now what? Can you imagine your fridge without coke? Can you see yourself as a veggie lover, brown rice, small portion eater, only green tea-no-sugar drinker, walker, biker, runner and dancer? When your child wants some ice cream, are you going to say no? Or think that he will be unhappy without it, because all other children have it. And they sure will yell and ask for sweets because they watch tv commercials about “immune boosting”, sugar loaded cereals and other sweets and you cannot do anything about that. If you can stand him and restrict him from all those temptations, do you know what are you going to feed him instead? Now the news claim that our pets are obese. They sure watch commercials too. BTW, the yogurt which is advertised as healthy is not healthy at all, if you want healthy stuff, mix some plain yogurt with fresh-cut fruit, and no sugar at all.